Both Leetaejun and Dean have apologized for their misdeeds. Both Geum “Dean” Dong-geun and Lee “Leetaejun” Tae-jun, formerly of Lunatic-Hai, will quit Overwatch following accusations of inappropriate fan interaction. The two Lunatic-Hai players were suspended by team management for two months after female fans came forward with stories of misconduct. Both Dean and Leetaejun have since admitted fault and apologized, but later decided to retire from Overwatch. Leetaejun, in particular, took to his Twitch stream to address his fans directly. A translation from Reddit reported that Leetaejun said he “knows he cannot be forgiven for all the trouble he caused for his fans and [Lunatic-Hai] members.” The former Lunatic-Hai player has already spoken with management about his retirement and will keep the public updated via his Twitch stream. Dean announced his retirement in a statement earlier in the week, though it was confirmed by OGN’s English casters during this morning’s broadcast. With eight members in its roster, Lunatic-Hai itself still has a full lineup. Gong “Miro” Jun-hyuk stepped in as Reinhardt for Dean—though Dean was benched last match—with Kim “EscA” In-jae on DPS, replacing Leetaejun. 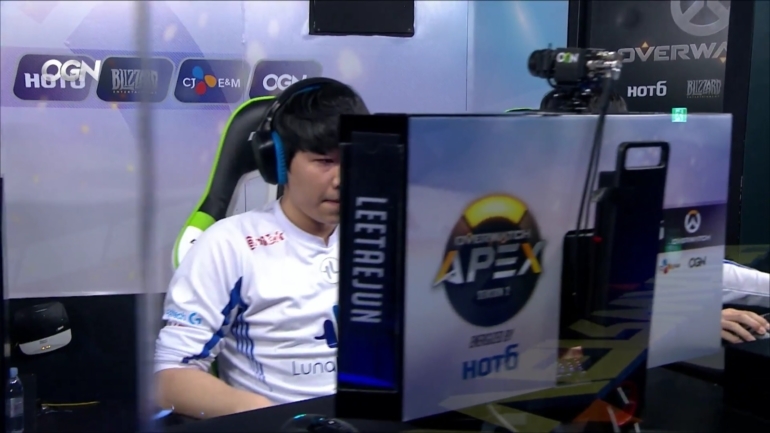 The last-minute swap in of EscA for Leetaejun had little effect on Lunatic-Hai’s dominant playstyle, as the newly secured roster ended up taking out LW.Blue 3-1. Fans also seemed to have been backing up the team as a whole, with no shortage of cheering during the matches against LW.Blue.